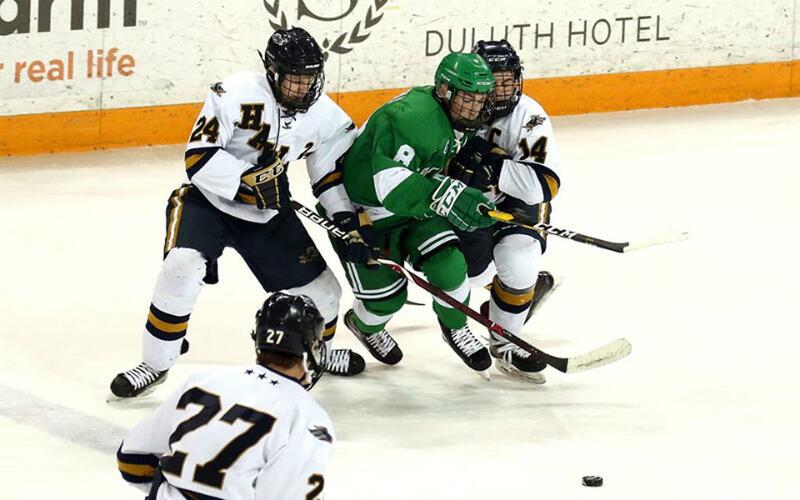 Last Saturday’s Class 1A finale put two programs with some not-so-familiar faces under the spotlight at the Xcel Energy Center in downtown St. Paul, as fourth-seeded Greenway collided with No. 2 seed St. Cloud Cathedral, resulting in a 5-2 Crusaders’ win and the teams combining for nine all-tournament selections. Even though the Raiders fell short of winning the title, their run to the championship game impressed. They knocked off Delano 6-4 in the quarterfinals, then followed that performance by defeating top-seeded Mahtomedi 3-2 in the semifinals. Forwards Ben Troumbly and Donte Lawson, goalie Logan Wright and defenseman Cameron Lantz represent Greenway on the all-tournament team. Troumbly and Lawson combined for 15 points, 10 hits and several highlight-reel worthy moments in the tourney, with Lawson being honored with the Class 1A Herb Brooks Award, which came with a $1,000 scholarship from the Herb Brooks Foundation. In addition to winning the tournament hardware, St. Cloud Cathedral earned five selections to the all-tourney team, with forwards Nate Warner, Jackson Savoie and Jack Smith, goalie Noah Amundson, and defenseman Jon Bell being honored. Warner, a junior committed to the University of Minnesota, led the Crusaders in tournament points, with four goals and four assists. He had a goal and a pair of helpers in the championship round, while Savoie and Smith each finished with six points. Amundson, who looked particularly stout late in the championship game, recorded 75 saves on 79 shots in the tournament, good for .949 save percentage and 1.33 GAA. In Class 2A, No. 1 seed Edina boasts five honorees after edging Lake Conference rival Eden Prairie 3-2 in overtime to win its first state title since 2014. Senior forward Liam Malmquist generated a lot of buzz among the Hornets who made the list, producing four tourney goals — three of which against St. Thomas Academy in the semifinals — and a pair of assists. Malmquist is joined by teammates Jake Boltmann and Mike Vorlicky, who are both defenseman, along with forward Jett Jungels and goaltender Louden Hogg. The third-seeded Eagles, meanwhile, garnered three selections in defenders Luke Mittlestadt and Keegan Langefels, and forward Jack Jensen, who received the Class 2A Herb Brooks Award. The all-tournament teams were presented by Wells Fargo and the Minnesota State High School League. Recipients were chosen by a panel of coaches and members of the media who attended the tournaments. View the tables below to see the complete lists for each team.